It started as a simple front paw declaw. Poor guy, had his surgery Thursday and mom and I went to visit him Friday and then Tim and I were able to pick him up Saturday afternoon about 1:30pm. We weren't home 20 minutes before he tried (key word tried) to jump up on the guest room bed to see Tim. Well, we had figured he would. I had discussed where to keep him confined for a few days in great detail with the veterinary staff. All figured that everything was nice and soft in there. So, as he was sliding and falling back off the bed, I knew we had made a mistake. So, he started bleeding from his one paw and off mom and I went to the Emergency Vet over in L'ville. (Tim had to work at the tv station and couldn't go...wah!) I thought I knew how to get there but I apparently either didn't or was so upset I once again missed the sign for Outer Loop Rd. Which doesn't say Rd. by the way like everyone was telling me and it's so tiny at the top of the interstate sign that all you really read is Okolano and Fairdale. So after forty minutes going in circles, we finally arrived. Three hours later we left. Junior in the bandage with medicine on his slightly opened wounds, pain meds, an antibiotic and a big bill. I spent the next couple of hours dragging the box springs out of the room (Tim had already taken the mattress and nightstands out), dragging the mattress back in, making the bed, etc....I was so whipped from the whole long afternoon and evening that I fell asleep on the mattress for over an hour. Junior snuggled up in the blankets in the corner and slept. So, today I feel like an official new cat mommy. I'm tired, I haven't showered, haven't washed my hair in two days and I am still in my pjs having never gotten out of them all day! At least Junior has been calmer today and slept under the tall chest of drawers for most of it. Tomorrow I call our vet and discuss whether they need to see him or not as he is favoring that one paw. Honestly, this wasn't so hard years ago with Garden Kitty or Oscar! Oh, and Garden Kitty threw up in three places upstairs today so I let Tim clean all that up. 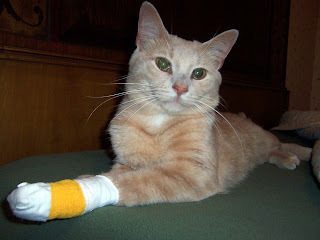 Timmy and Alphonse both had paw troubles when we had them declawed. Oh, well, that makes me feel a little better! Tim keeps saying GK didn't have a bit of trouble! Course she was recovering from spaying too!